Just about 25 miles north of downtown St. Louis is a spectacular holiday light display at the Rock Springs Park in Alton, Illinois. Each year, the park is decorated with millions of colorful lights to celebrate the Christmas season as part of the annual Christmas Wonderland tradition. Christmas Wonderland opens each year after Thanksgiving and closes in late December. In 2018, Christmas Wonderland is open nightly from November 23 through December 26. Although the park doesn't officially open until dusk, people typically begin lining up about 30 minutes to an hour before sunset on busy weekends, especially as the holiday approaches. Christmas Wonderland is a drive-through display, but there is a special walk-through night on Monday, November 26 when only foot traffic is allowed. The lights are so bright in the park that you are encouraged to turn your car's headlights off to get a better view as you drive through the display. Each year, a group of volunteers called the Grandpa Gang helps string more than four million lights over a mile and half of the park at Christmas Wonderland. There are dozens of colorful scenes that include a cascading waterfall, lighted tunnels, a snowman village, laser display, and light-wrapped trees. Visiting Christmas Wonderland is a tradition for many area families who like to come back year after year to take in the familiar scenes and see what's new. Christmas Wonderland has other attractions in addition to the lights; children can also visit the petting zoo and feed the animals. Feed is available at the Santa Claus House for a small fee. While at the Santa Claus House, kids can also have their pictures taken with Santa himself. Admission is charged per car to get into the park, but if a group of 10 people or more is in one vehicle, each person will be charged individually instead. Christmas Wonderland also offers carriage rides through the display on Saturdays on a first-come, first-served basis. To get to Alton's Rock Springs Park, take the Clark Bridge across the Mississippi River into Alton. After crossing the bridge, turn left on U.S. Highway 67 North (Landmarks Boulevard) to College Avenue. The park is near the intersection of College and Washington Avenues. After you're done driving through the lights, you can drive a few miles to the Bethalto Christmas Village, which happens on weekends from Thanksgiving until the weekend before Christmas. 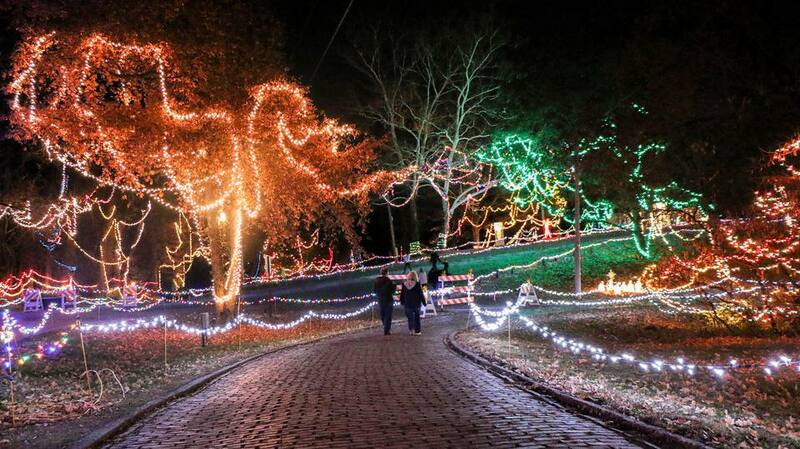 Beautifully decorated in dazzling lights, the town of Bethalto comes to life with holiday cheer each season. Features of the Christmas Village include Christmas-themed cottages, live entertainment, craft and food vendors, Santa Claus, and a live nativity scene. Also close by in Jerseyville, you can check out the annual Downtown Country Christmas on Saturday, November 24 fro 2 to 8 p.m. This community festival features Mrs. Claus' Bake Shop, an Elf School, kids activities along Elf Boulevard, tours of the Cheney Mansion, live music, and Rudolph's Red-Nosed Lighted Parade.